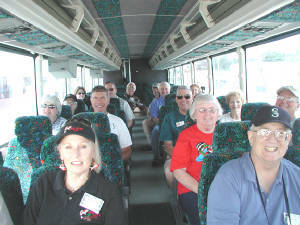 “Wow, what a ride!” That’s how the members of the Mid-Columbia Koi & Pond Club felt when the 22nd Annual PNKCA convention ended after the Sunday afternoon pond tour on June11, 2006. 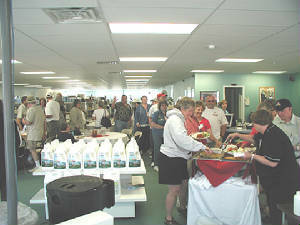 But the fun began on Friday, June 9 with 13 vendors busily setting up their displays as club members from all over the northwest greeted each other in lobby of the Shilo Inn in Richland, WA. Later that evening the MCK&PC hosted a wine tasting with at least 9 different wines that were produced and bottled in the Tri-Cities. Next to the wine was delicious custom made dark and white chocolates (some in the shape of fish!) from Baum’s Chocolate Shop in Richland. When the convention committee found out that June 9th was also speaker Art Lembke and his wife, Nicole’s 33rd wedding anniversary, a cake, roses and an announcement were added to the evenings’ festivities. Saturday—what can I say, it started early and it was busy. The convention committee had many MCK&PC volunteers, who actually started on Friday night, registering convention goers, selling raffle tickets and (on Friday) wine tasting tickets. And between Friday and Saturday, the hard working volunteers registered an astounding 128 people for the weekend events. Clubs and businesses were very generous with donations for the raffle and auction. A small group of people worked non-stop all day Saturday getting these items registered and sorted for that night. While the sorting was taking place speakers, beginning with AKCA and ZNA Judge Art Lembke, spoke to more than 70 people in the main ballroom. 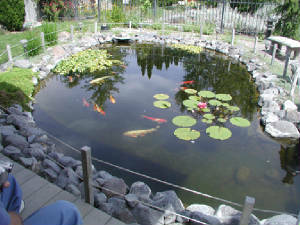 He was followed by Dave Moore of Koi Joy who showed pictures of his own and his customers’ ponds. At this point everyone broke for lunch. People generally scattered for lunch, but the PNKCA executive officers and club representatives met for a working lunch in the hotel’s lounge. That was where the Idaho Water Garden & Koi Society gave me a beautiful handmade plaque as a Friendship Award. I was so surprised! And honored. After lunch Mordi Haimi of Mag Noy, Ltd. discussed KHV. 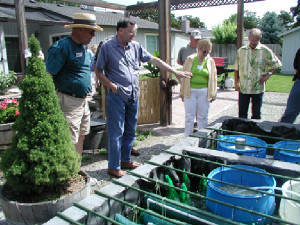 Then Master Gardner Jan Jordan, of Richland, discussed the use of plants in ponds. I have to say, the convention committee was so excited about the speaker lineup. It took us several months to get the speakers we wanted. I believe all those who sat in on the talks appreciated and enjoyed the speakers and came away with new information. There was a short break between the speakers and the evening’s events. Dinner was served buffet style, and as far as I could tell, there was plenty of food, and it was very good, too! Awards were given after dinner with Norm Call receiving the Bronze Koi Award. I wasn’t quite sure of how it worked out but apparently, Norm was “tricked” into framing the award not realizing it was for him. He was so shocked when he was named to receive the Bronze Koi Award. It was great. Linda Montgomery, the PNKCA Chairman, presented the prestigious Ed Fujimoto awards, and I was honored to be the one from my club to receive this year’s award. During the day the AKCA/KoiUSA vendor booth, represented by Charlie and Brenda Atwell, gave out surveys that asked what kinds of information, articles and features people wanted to see in KoiUSA. Those who took the survey had a chance to win a portable DVD player. I was sitting at the same table with Art and Nicole Lembke that evening when it was announced that the name would now be chosen for the DVD player. Art had just said, “Oh, that would be nice for the trip home,” when Nicole’s name was announced as the winner. Boy, were they surprised! Actually we all were. Larry Christensen and his hard-working auction crew took care of the auction. This was something my committee and I were glad to let them do. They offered to let us run the auction, but why re-create the wheel? They all did an outstanding job, and we had excellent bids made on lots of items. Early Sunday morning the two buses were lined up and ready for the pond tour. I ended up helping one of the drivers navigate to the different ponds. When it turned out that we were slightly more than an hour ahead of schedule, we made the impromptu decision to stop at Beaver Bark, one of our local nurseries that have a beautiful assortment of plants, pond items, and yard ornaments. If you get a chance, be sure to ask Larry Christensen about the yard ornament he bought—a very large snail. I still don’t know how he got it in his car! Koi Joy was our host for lunch. A catered meal of lasagna, bread, salad and iced tea was perfect. After eating, people wandered around Dave Moore’s shop and were really impressed with his 18,000-square-foot shop dedicated to koi and any kind of equipment you could use for keeping them. Also I want to mention that Koi Joy was our convention’s Platinum Sponsor. A Platinum Sponsor donates $1,000 to the convention. But, thanks to Dave’s generosity, Koi Joy donated more than $2,000 worth of merchandise to the convention for the raffle and auction. Thank you very much Koi Joy! Also, thanks to Jims Koi and PattiGrafix for their generous donations to the Super Raffle. Reflecting back on that weekend, the thing that stands out in my mind is how everyone seemed to be having so much fun. Folks said they liked the decorations; the food was great; the hotel hospitality was outstanding; they loved the chocolate and wine; loved the grounds around the hotel and the view of the river. Several guests took advantage of the beautiful walking trail next to the hotel and found their way to Howard Amon Park and enjoyed the music being played at the Fingernail Stage. Our headline speaker, Art Lembke and his wife, Nicole, enjoyed the cake and flowers on Friday night, but they really loved discovering Rosies Ice Cream Parlor and treating themselves to cones while making their way to Howard Amon Park on Saturday. This is what the convention committee wanted all along. For people to see and enjoy what we believed was the best the Tri-Cities had to offer—big skies, big river, beautiful park, fine wine, and fun! And thanks to a hard working committee and lots of equally hard-working volunteers, I believe we accomplished that. I also want recognize the families who opened their homes for the pond tour: John and Kelli Nealy; Leland and Kim Schultz; Lowell and Judy Hill; Ron and Gloria Boedeker; and Mitch and Suzi Vitulli. The Vitullis also served refreshments, which everyone appreciated. If you couldn’t make it, we missed you and you missed a good time. I believe the 11 months of planning with a dedicated committee helped things go smoothly. The MCK&PC volunteers made the difference. They worked hard, without complaint, and along the way had a good time, too. Next year’s convention will be held in Vancouver, Canada on June 16th and 17th. If you would like to attend or have any questions about the 2007 PNKCA Convention contact: Richard Adema at radema@can.rogers.com I know I am looking forward to going to it. I met many of you for the very first time at this year’s convention, and I hope to get reacquainted with you in Vancouver. However, with the way things are in today’s world it would be a good idea to have your passport with you when you go. It will just be easier should the border patrol decide they want to see one. Thanks to Norman Call and Elsie Browning for sharing photos. The speaker lineup for this year’s PNKCA convention is complete. The first one we discussed in an earlier article was Art Lembke, who is an AKCA and ZNA Certified Judge. 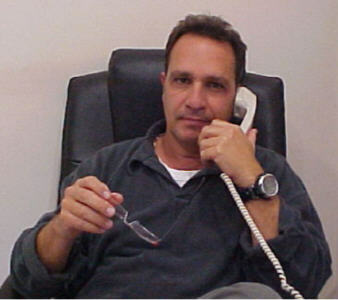 Joining Art in the speaker lineup will be Mordi Haimi from Mag Noy Ltd., of Israel. If you subscribe to KoiUSA Magazine, look at the inside back cover and you will no doubt see an ad for Mag Noy Ltd. That is where Mordi works. Mag Noy Ltd. is an ornamental fish marketing organization that handles the fish stock of five separate fish farms in Israel. The fish includes Koi, gold fish and tropical fish. Mag Noy is the biggest ornamental fish marketing organization in Israel, and every year ships millions of fish all over the world. Mordi has been at Mag Noy since 1999 but said he learned to love and appreciate Koi in 1991 while working Gan-Shmuel Fish Breeding Center as a fish pathologist. Gan-Shmuel is one of the fish farms in Mag Noy. He is responsible for developing working standards, which become part of the company’s working procedures in all of the farms. Most of all he’s concerned about KHV. Mordi said he’s “been very involved in all the research concerning KHV,” and added that five different groups within that organization meet twice a month to compare notes and exchange information about the virus. They also communicate with researchers worldwide. That communication finds its way close to home because Mordi travels frequently to the U.S. to visit May Noy’s distributors. “We look after our customers, as we do not take them for granted,” said Mordi. “It’s important to me to know how their season was and if they had any problems.” While here he also attends forums that deal with KHV. Staying on top of KHV is important for May Noy, as the virus nearly wiped out the Israeli farms in the early ‘90s. Since that time researchers at May Noy have been working hard to develop their “Super Health Koi” that is resistant to KHV, and believe they have succeeded in doing so. Mordi has a BA in Biology from Tel Aviv University and an MA in fish disease from the Hebrew University in Jerusalem. And, while his official work title at Mag Noy is Health & Quality Assurance Manager, Mordi has an interesting resume. Before his career in fish health Mordi was a dolphin and sea lion trainer at the Tel Aviv Dolphinarium. As a college student, he helped train Capuchin monkeys in the “Helping Hands” project which trained monkeys for quadriplegics. Mordi and his wife, Shani, have a daughter, Noya, who is 6 and son, Inbar, who is 4. When he isn’t working Mordi and his family like to travel. “We travel a lot in Israel mainly in the desert to go hiking and camping,” said Mordi. Editor’s note: Articles on the final two speakers, Dave Moore, owner of Koi Joy in Kennewick, WA, and Jan Jordan of Richland, WA, a Master Gardner and pond plant expert, will follow in later issues. 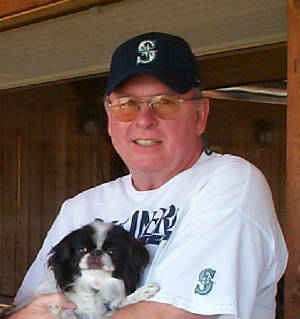 As plans continue to rev up for next year’s PNKCA Convention, the Mid-Columbia Koi and Pond Club is pleased to announce that Art Lembke, a 31-year koi hobbyist and a AKCA and ZNA Certified judge has agreed to be one of its guest speakers. Lembke said this will be the first time he’s been to a PNKCA Convention. “The conventions seemed to always fall around the same time as the AKCA Conventions where I have lots of different jobs as a member of the AKCA judging commission,” said Lembke. Indeed, Lembke is a busy man. 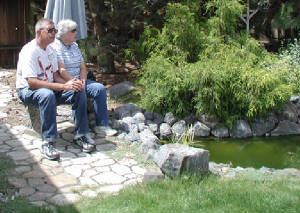 He and his wife, Nicole, joined the Mid-Atlantic Koi Club in 1990. Lembke said they both enjoyed the club and its members so much he quickly became involved by holding positions such as President and Vice President; MAKC Show Chairman twice; Koi Bencher; and his club’s AKCA Rep. Many trips to Japan to visit koi breeders accelerated his passion for koi, and by 1996 he was a Certified Judge. In 1998 Lembke became a ZNA Certified Judge, and a member of the AKCA Judging Commission, a position he holds today. Other koi related activities include articles Lembke’s written for Koi USA, Nichirin, and the MAKC Newsletter, in addition to several other magazines. On the lecture circuit he’s attended judging seminars and discussed water quality, koi nutrition, koi selection, filtration, treating koi diseases, injection techniques, winterizing the pond, and advanced koi appreciation. Lembke said teaching these topics has taken him and Nicole around the world. Closer to home, Lembke has served as judge at Northwest shows four times, most recently in Spokane. But let’s talk about ponds! If you have the May/June edition of KoiUSA, you probably read the article Lembke wrote about the new house and 18,000-gallon indoor pond he and Nicole recently built. Lembke said the whole project took about 8 months and they are very happy with the final results. Happier still may be Lembke’s 15 koi who average 28-30 inches and live in year-round comfort in a temperature-controlled pond. When asked to name his favorite koi Lembke’s response was quick. “That would have to be my Shiro Utsuri that I’ve had for 10 years now.” He said the 15-year-old fish has been named champion five times. Dave Moore, owner of Koi Joy Pond Shop in Kennewick, WA, will be the third speaker at PNKCA’s 22nd Annual Convention, Trade Show and Pond Tour to be held June 9-11 at the Shilo Inn in Richland, WA. When Dave takes the podium he will show, through slides, ponds his customers have built and illustrate how ponds can be built in any kind of space. "Even though they may have the room, most people build their first pond too small," said Dave. "I usually tell people to build bigger than they think they want it, because most people end up rebuilding once the koi bug bites, and they find out they need more room for their pets." When Dave built his pond 25 years ago he didn’t make this mistake. His first and only pond is 9,000 gallons and is shared by koi and, occasionally, Mallard ducks. "I decided my aquarium was too small," noted Dave. He added that some of the fish he dropped into his pond then are still there today. When you consider how long ago he built his pond it’s not hard to imagine how the available pond products on the market have changed. But, in fact, there were few pond products back then. "At that time building a pond meant I needed to be very resourceful, because there wasn’t anything on the market you could buy specifically for pond construction," said Dave. For instance, pond liners were not available so Dave constructed his pond with concrete. For other types of equipment such as pumps and filters he relied heavily on swimming pool products retrofitted for pond use. It was also during this time that Dave opened Koi Joy which he ran from his home. After a while Dave and his wife, Barbara, moved their business to a small office with storage space in Richland and remained there until three years ago when the business was moved to much more spacious quarters in Kennewick. "We went from 2,800 square feet to about 18,000 square feet—I think we’ll be here a while," noted Dave. And while they have several tanks of koi for sale in the back of the shop, Dave said they have plans to eventually build a fish house. In his quest to have better products and make pond keeping easier Dave began making his own products, specifically pumps such as the Superfalls. Dave and Barbara run the business with their daughter Kelli and her husband, John. Other family members pitch in and help on a regular basis, especially during the busy times. "The last five years have been very busy," said Dave. "People want more from their home, and ponds just seem to add what they are looking for. Today, landscapers just about have to offer pond construction services because the demand is so great." Editor’s note: The next and last bio will be on Jan Jordan who is a certified Master Gardner and Koi Health Advisor. J an Jordan, a Master Gardner and avid garden pond enthusiast, is the fourth and final speaker lined up to speak at this year’s PNKCA Convention held June 9-11 at the Shilo Inn in Richland WA. A certified Master Gardner since 1996, Jan will present a slide show and discuss water gardening, pond plants and how she works with her fish and the frogs that visit her yard every summer. And while her interest changed from gardening in the ground to gardening in several feet of water, Jan said it wasn’t her idea in the beginning. “It all started when my oldest son, Kris, who was 13 at the time, showed me a picture of a pond in a book and asked if we could make one,” said Jan. “He had some big triple-decker fort in the back yard that was a real eyesore. I told him that if we were going to have a pond, it would have to go in place of the fort.” So two days and four-trips-to-the-landfill later, Jan and Kris were ready to dig. The pond they built is about 1,500 gallons and is a two-tiered informal shape with a waterfall. But then there’s the frogs. Jan said some tadpoles were discovered in a neighbor’s swimming pool cover, and the owners were getting ready to open their pool for the season. “They were going to dispose of the tadpoles so a friend of mine collected them and gave me some,” said Jan. “Many a parent in the Badger Mountain school zone got tadpoles that year.” Jan decided to encourage the frogs to stay in her yard by providing them with a kiddy pool. “This way the fish wouldn’t eat them,” noted Jan. Young frogs soon found Jan’s cool, tree-lined back yard to their liking and are now annual visitors. A few years later Jan decided she was tired of the annual kiddy pool so she and Kris built a shallow, formal-shaped pond for the frogs and water gardening. Once the tadpoles start getting limbs and hop out of the pond Jan adds a few goldfish for mosquito control. The plants include lotus and tropical and hardy lilies. In the winter time Jan keeps a small Beckett Patio Pond in her living room where she stores outdoor tropical plants for the winter. Plants such as Taros, Palm plants, Bog lilies and tropical lilies find a safe haven tucked in between aquariums of goldfish and a quarantine tank. Also, Kris keeps two tanks of tropical fish in his room. Today Jan’s full time job as a middle-school Para educator keeps her very busy, but when she’s not working in her own yard she still finds time to devote to her Master Gardening projects. 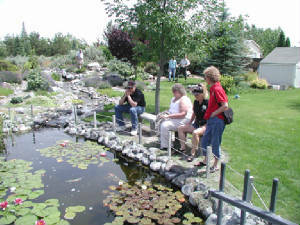 A couple of years ago the Master Gardner Foundation decided to build a Demonstration Pond at the Kennewick Library, and because Jan had experience with ponds she “volunteered” to help co-chair the project. To this day it stands out in her mind as one of most stressful things she’d done. “The garden included a fairly large demonstration water garden, bio-filter, stream and waterfall,” said Jan. “On one particular day we worked a grueling 16-hours and when it was over I was pretty proud of the fact that that no one had a compelling urge to drown any of their co-workers in the pond after it was filled with water!” Today Jan stays involved in the Demonstration Pond as the co-chair of Pond Maintenance. 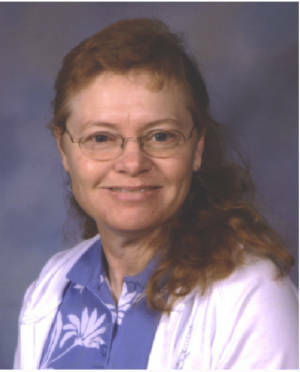 Jan is the past president and vice president and newsletter editor of the Mid-Columbia Koi and Pond Club. She now serves the club as its contact person and AKCA Rep. In 2000 she was awarded Koi Person of the Year and 2002 the Ed Fujimoto Award. In 2002 Jan became a certified KHA after completing an on-line class through the AKCA and a full weekend wet-lab held in Portland, OR. Jan shares her home with her husband, Alan, and sons Kris, 24, and Scott, 17. Son, Jesse, 21, is married, and recently completed a tour of Iraq. He is stationed at Ft. Hood, TX. For those who live in the Mid-Columbia area, you might want to join Jan’s e-mail list called JJ’s Ponding Tidbits. Jan said if subscribers would like to make others aware of some good deals, a ponding funny—or disaster, or have fish and/or plants for sale they can e-mail it to her and she will post the information. Contact her at MCK&PC@jjspond.us.